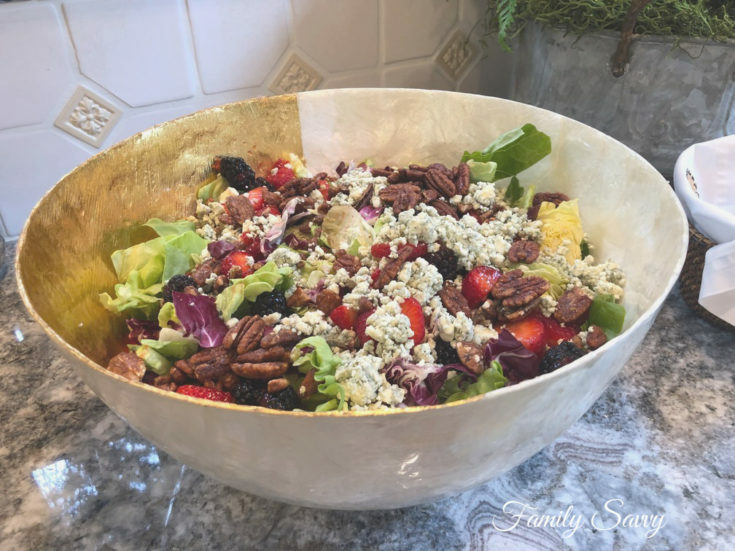 This easy peasy baby blue salad is a quick, easy to make (but super delicious) version of one of the South’s most famous salads thanks to some top rated store bought products. Franklin’s Homewood Gourmet was one of the first to make baby bleu salad famous. Now, you’ll find a version of baby bleu salad at most any eatery in the South. Despite the tweaks, the key players typically include baby greens, blue cheese, a fruit, a glazed nut, and a vinaigrette dressing. I’ve made baby bleu salad the hard way (glazing my own nuts and making vinaigrette). Although this is preferable for the ultimate flavor, it isn’t always practical. Where making homemade glazed nuts and vinaigrette are concerned, there are simply days that “ain’t nobody got time for that.” Seriously. Easy peasy baby bleu salad uses some of the best convenience items to make a company worthy baby bleu salad. I make this easy peasy version often, and I get compliments most every time. My store bought “faves” are listed below. I’ve based my choices on years of trying various products. I also heavily rely on Cook’s Illustrated taste tests. For those of you savvy readers who WANT to make your own glazed nuts, I have two recipes that I’ve used for years. Both are sugar & spice pecans. Click here for the oven version; click here for the slow cooker version. If “you ain’t got time for that,” then check out the store bought versions below. 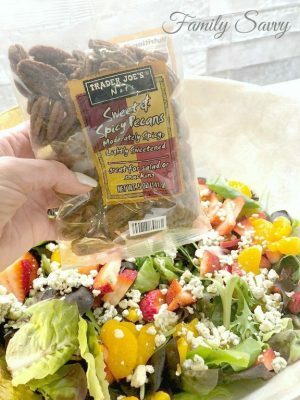 Trader Joe’s sweet & spicy pecans are my hands down fave. They are the closest in flavor to the nuts used in Franklin’s Homewood Gourmet baby bleu. Emerald glazed nuts (pecans or almonds) are my second favorite nut for salad. 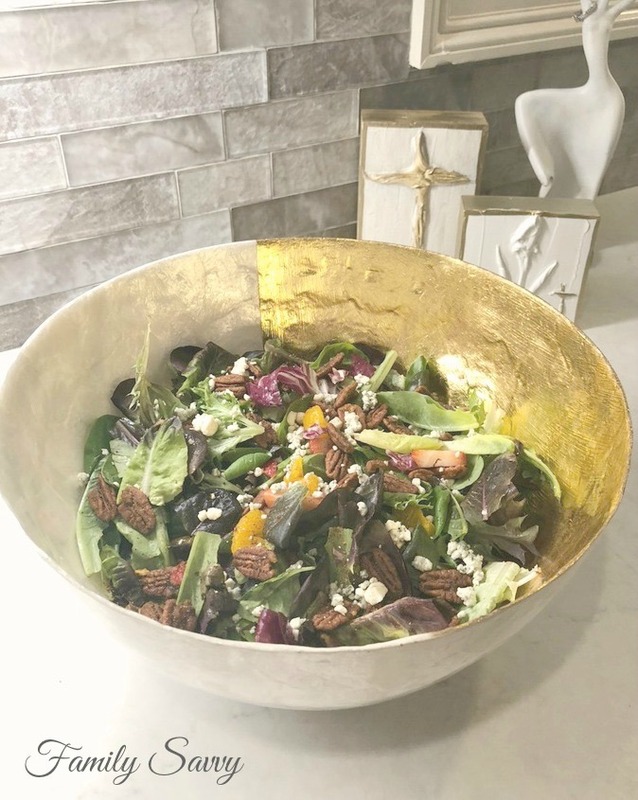 Brianna’s Blush Wine Vinaigrette and Brianna’s Creamy Balsamic Vinaigrette are my top store bought dressing choices for this salad. Ken’s Steak House Lite Raspberry Walnut Vinaigrette is a close second. 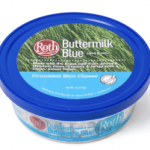 Roth Buttermilk Blue is fabulous; click here to find retailer near you. 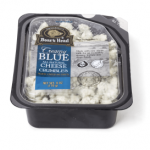 Boar’s Head Blue Cheese Crumbles are always good and are wherever Boar’s Head is sold. I included all the ingredients for the Easy Peasy Baby Bleu Salad below. If you make this, I’d love to hear what you think. Comments from readers are my fave. As always, thanks so much for stopping by. Be blessed, and stay savvy!!! Add well drained orange segments. Add blue cheese & nuts. Toss with small amount of dressing; adding more to taste.